This is a very UNIQUE CATALOG. 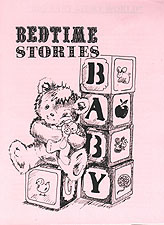 Babies do love bedtime stories, so the catalog is also an Adult Baby Bedtime story catalog. It has short stories throughout the fashion catalog. A large centrefold also shows you a COMPLETE BABY LAYETTE; to make your shopping easier. Add the BABY SHOWER VIDEO [Fashions Video] featured in this section, to see the COMPLETE ADULT BABY COLLECTION ROMPER ROOM has to offer you!